This sculpture of the she-wolf is an Etruscan work of the 5th century BC, but the figures of the twins are modern. 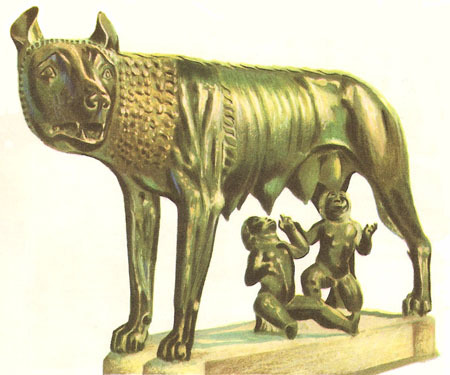 Legends were created by poets and historians to describe the origins of the Roman people, and the story of Romulus and Remus was one of these. It was certainly not made up until about 400 years after it was supposed to have happened. Nevertheless, the Romans believed these stories because they appealed to their sense of national pride. The Trojan leader Aeneas, the sole survivor of the captured city, reached the coast of Latium after many adventures. Here, after marrying Lavinia, the daughter of King Latinus, he settled down. Aeneas's son Iulus founded the city of Alba Longa and became its king. During the next four centuries eight sovereigns ruled the city, and in the eighth century BC the throne was occupied by King Numitor. Numitor's younger brother, Amulius, plotted against him and drove him from the throne. Numitor had a daughter, Rhea Silvia, and Amulius was afraid that she would marry and have sons who might depose him, so he forced her to become one of the Vestal Virgins who were forbidden to marry on pain of death. However, the story says that the god Mars managed to marry Rhea Silvia secretly, and she gave birth to twin boys, Romulus and Remus. When Amulius heard of this, he ordered Rhea to be imprisoned. The twins he ordered to be drowned in the River Tiber. But a servant took pity on the babies and placed them in a chest, which he threw into the Tiber. The chest, being wooden, floated and was washed up on the banks of the Tiber near the future site of the city of Rome. There, a she-wolf found the two boys. For some time she looked after them, and later they were adopted by Faustulus, one of the royal shepherds, who brought them up as his own children. The two boys were remarkable for their strength and skill, and became the leaders of all the local young men. On one of their daring raids Remus was captured and brought before Numitor. Romulus came to his rescue, and the young men realized that the old man was their grandfather. Together they attacked Alba Longa, killed Amulius, and restored Numitor to the throne. The brothers then decided to found a city near the place where the wolf had found them. They agreed to ask the gods to decide which of them should be king; the sign was to be that the one whom the gods favored would see a greater number of birds in the sky than the other. Remus climbed the Aventine Hill, and from the top he saw six vultures. But no sooner had he claimed the throne than Romulus saw twelve vultures from the Palatine Hill. The question was undecided once more, and the rivalry between the two brothers grew more bitter. Romulus, determined to be the ruler, began preparations for the dedication of the new city, but Remus insulted him by jumping over the wall, which Romulus had just begun to build. Infuriated, Romulus killed his brother, crying: "So perish all those who cross this wall." Romulus was now left as sole ruler of Rome. His first action was to surround the Palatine Hill with a defensive wall. In order to increase the population of the young city Romulus promised asylum to all who came there. This offer naturally attracted thieves and murderers, for whom life in their own country was impossible, and many of them flocked to Rome. Life was not very safe among such people, and Romulus was always escorted by an armed guard of 300 men. The population of the new city was largely male, and in order to obtain wives for them Romulus attacked the Sabines, a neighboring people, and carried off their women. This gave rise to a war between the two peoples, but the Sabine women managed to pacify both sides, and it was agreed that they should amalgamate and form one people. Romulus had to agree to having the king of the Sabines, Titus Tatius, as his colleague. However, Titus died very shortly afterward. Romulus was once more the only king, and he reigned for 40 years. During this time he fought several victorious wars against neighboring cities. At the end of his reign Romulus was mysteriously snatched up to heaven while he was reviewing his army. The Romans worshipped him as the god Quirinus, and he was believed to watch over the welfare of his city.